Alameda old – but with new bones. 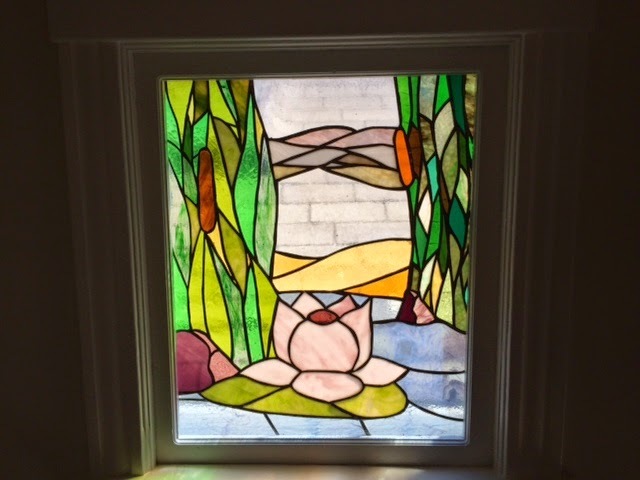 This was an amazing stained glass window in a vacant house that I went into recently. You can see the roof behind the glass on the neighbor’s house next door. I’m quite sure it is original. It was one of two stained glass windows…and those were not only the most unique windows in the house, but the best in the house….everything else was left for the next owners to do and/or redo. The recent Napa earthquake not even a week ago, made me very grateful that all who I knew in Napa was protected, including my daughter-in-law’s amazing family made up of multi-generations, plus others in the area that I know. When the quake hit here at 0 dark hundred on Sunday am, I woke up…then lay in bed….wanting to see what was going to happen next. The answer was….nothing. No crashes, nobody in the apartments got me out of bed, no alarms….nothing. Now reverse the date to 1988, when we bought this house. We moved in and the contractors and construction folks moved in too (or so it seemed). They replaced the 88 year-old brick foundation, created legal ceiling height and added two bedrooms, a full bath, and a laundry room…because we required the extra space for our family. It took them 11 months or so to finish the project. And that was good…because if the quake had been about 2 months sooner, we would have still been balancing on beams. When the ’89 EQ happened you couldn’t buy insurance if you were on a brick foundation, and without insurance, you couldn’t get a loan. But insurers were writing on bricks before the big shake. These days (from 2012 when real estate began to heat up) the market has met, or in some cases exceeded the high dollars of 2007-08. I sold a lovely cottage for clients (who bought the house through me), with a full brick foundation, and sold it in early 2012, with the bricks. These days, there have been a good number of Victorians for sale complete with good, old, Victorian brick foundations. Quaint is nice…but seismic strengthening is better. And it takes more cash to do the retrofit. Contractors are busy all over town making up for lost time. It was a day after the recent quake that I realized that the old, but lovely lady (Victorian) next door was balancing on beams herself! Yes, we are living through this again! But most of our neighborhood as been through this rejuvenation. So here’s to Alameda looking old, but feeling like new! Broker Tour Tuesday...great week for a ride on the main island where I saw most of the properties. 13 came on the market but 2 were repeats, and 1 was entered twice. Alameda Real Estate Awards…this is only my perspective! Get me to rehab this is a Ballena Bay townhouse, what was started is unfinished still. A mess and most likely cannot get any loan…so you need all cash or need cash and own a construction crew! Have a great 3 day weekend! Fall is whispering it’s about to show up!! Previous Post Previous post: Which Filter to Use?